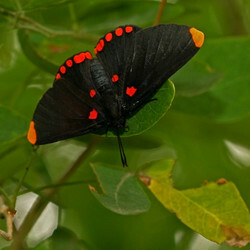 Riodinidae are a pantropical family, with the majority of species occurring in the neotropics. The tree shown is implied by classifications of Harvey (1987), Corbet et al. (1992), Campbell et al. (2000), Hall (2003) and Lamas (2004), and should be viewed as an informal hypothesis in need of corroboration. Although Erycinidae Swainson 1827 appears to be a senior name to Riodinidae Grote 1895, the type genus Erycina Fabricius 1807 is a junior homonym of Erycina Lamarck 1805 (a genus of bivalve mollusk). A family-group name cannot be based on a generic name that is a junior homonym (ICZN Article 39), so Swainson's Erycinidae is invalid. The Commission ruled (ICZN opinion 1073, 1977) that the family group name for this taxon should be Riodinidae Grote 1895 (1827), based on the replacement generic name Riodina that was selected by Westwood , even though there are alternative family-group names with priority (e. g., Nemeobiinae Bates ; Mesosemiini Bates 1859). (Bates employed Erycinidae as the family-group name for these subordinate taxa). This is one of the more confusing puzzles in butterfly nomenclature. Campbell, D. L., Brower, A. V. Z. & Pierce, N. E. 2000. Molecular evolution of the wingless gene and its implications for the phylogenetic placement of the butterfly family Riodinidae (Lepidoptera: Papilionoidea). Mol. Biol. Evol. 17, 684-696. Devries, P. J. 1997. 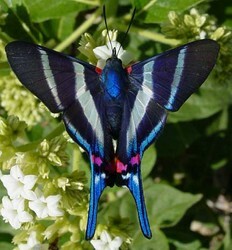 The Butterflies of Costa Rica and Their Natural History: Riodinidae. Princeton University Press, N. J. Hall, J. P. W. 2003 Phylogenetic reassessment of the five forewing radial-veined tribes of Riodininae (Lepidoptera: Riodininae. The Royal Entomological Society 28, 23-37. Harvey, D. J. 1987. 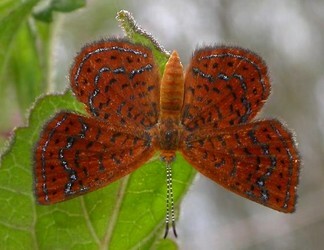 The higher classification of the Riodinidae (Lepidoptera). vii + 215 +  pp. Ph. D . Thesis, University of Texas, Austin. Page: Tree of Life Riodinidae Grote 1895. Metalmarks. Authored by Andrew V. Z. Brower. The TEXT of this page is licensed under the Creative Commons Attribution License - Version 3.0. Note that images and other media featured on this page are each governed by their own license, and they may or may not be available for reuse. Click on an image or a media link to access the media data window, which provides the relevant licensing information. For the general terms and conditions of ToL material reuse and redistribution, please see the Tree of Life Copyright Policies.